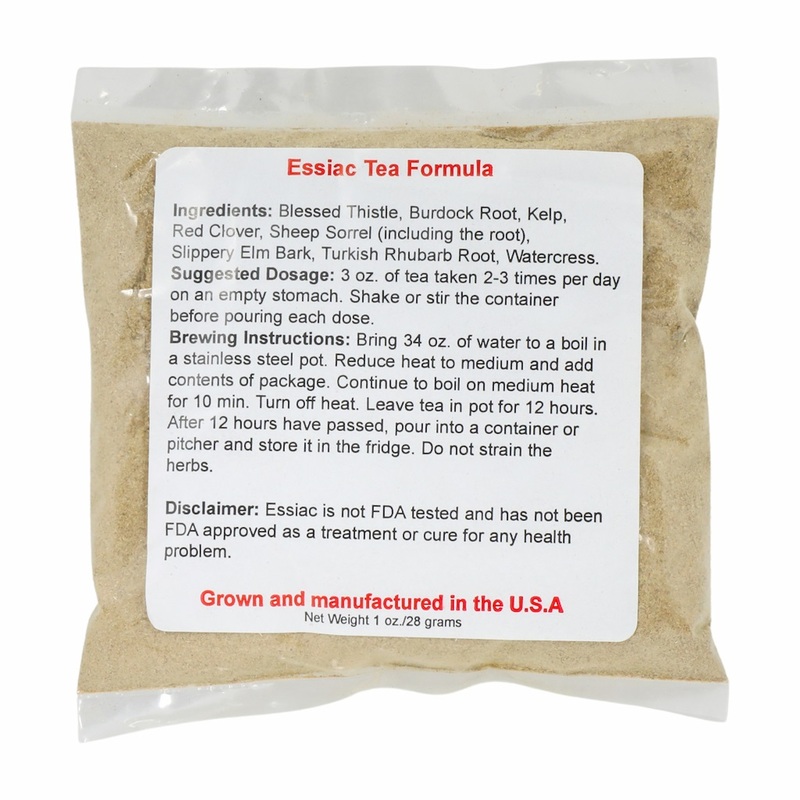 The essiac tea ingredients need to be blended in a specific ratio for the herbal tea to have the desired effect. When blended in the correct ratio, the eight essiac tea ingredients are believed to have a more powerful effect than each of the herbs taken individually. In other words, the blend provides a synergistic effect on health above and beyond the health-promoting benefits of each of the herbs by themselves. There is a shorter version of essiac, called the four herb formula, and that formula is public knowledge ("in the public domain)". We strongly believe that the original eight herb formula is a more effective form of essiac, and therefore we only offer and discuss eight herb essiac on this website. Click here to read about how the eight essiac tea ingredients work synergistically. Furthermore, we do not share our formula that we have been working with for the past thirteen years with others, because we fear that they will do what many other companies do--charge inflated prices for essiac. Our formula was tested clinically at the Brusch Medical Research Center in Cambridge, MA. Dr. Charles Brusch worked with Rene Caisse to develop the ideal form of orally administered essiac, and the resulting eight herb formula is the same one that we carry on this website. Click here to learn more: Eight Herb Essiac. Keep reading to learn a little about the eight herbs which make up the eight herb essiac formula. You'll learn about their beneficial properties and also their customary uses. Sheep Sorrel (includes root). Sheep sorrel is a rich source of oxalic acid, sodium, potassium, iron, manganese, phosphorous, beta carotene, and vitamin C. This essiac tea ingredient is a mild diuretic, mild antiseptic, and a mild laxative. Our blend contains the sheep sorrel root. Turkey Rhubarb Root. This detoxifying herb is world-famous for its healing properties. Rhubarb root purges the body of bile, parasites, and stagnating food in the gut by stimulating the gall duct to expel toxic waste matter. It has been shown to alleviate chronic liver problems by cleansing the liver. Rhubarb root improves digestion and helps regulate the appetite. It has also been shown to help heal ulcers, alleviate disorders of the spleen and colon, relieve constipation, and help heal hemorrhoids and bleeding in the upper digestive tract. Disclaimer: Essiac is not FDA tested and has not been FDA approved as a treatment or cure for any health problem, including cancer. We do not represent it as such on this site. You must determine whether essiac is a treatment method you should pursue. We have provided accounts and descriptions that represent the opinions of a variety of experts in the alternative treatment world as well as actual users of essiac. We believe that our formula is comprised of the most effective essiac tea ingredients in the world, and that our essiac tea ingredients are of the highest quality. However, we do not endorse anything on this site as medical fact.